9/11, mass animal deaths, continuous threats of war, and the unfounded announcements of the end of the world by evangelical zealots have created world-wide fears. These fears drive people to throw out rational thinking and prepare for the worst. While these preparations do have their place in society there is a point where it can become obsessive. 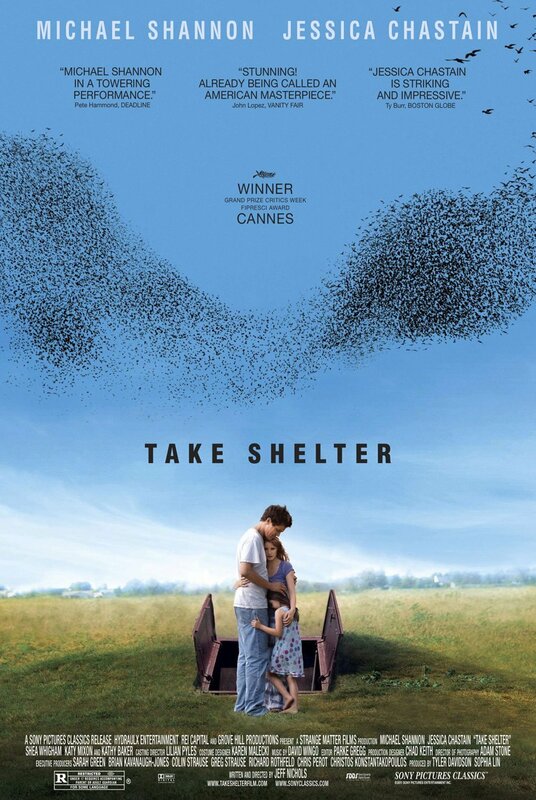 Take Shelter examines this phenomenon in a sympathetic form, and uses an effective visual language to create a sense of urgency of a potential looming threat. Curtis (Michael Shannon) has been having dreams and premonitions of a apocalyptic storm, and it is beginning to affect his reality. His wife, Samantha (Jessica Chastain) stays at home with their deaf daughter, Hannah. As Curtis’ dreams continue to concern him, there are indications that Hannah may be able to regain her hearing through surgery. After a series of storms, Curtis begins to think that an even larger storm is on its way, and begins to undertake a plan to extend their current storm shelter to be prepared for an unimaginable storm. Through small, brief clues in the film, mental afflictions have affected his family in the past, a clear indicator of his present issues. Curtis is a job site foreman and respected by his crew. His employment provides him with a gorgeous home, exceptional health insurance, and enough income to enjoy yearly vacations to the beach, but it was not enough to provide him with peace of mind. Curtis’ condition is initially just strange dreams and night terrors. Over time, his dreams affect his physical state during the day. His blue-collar work ethic and masculinity attempts to hide the more embarrassing afflictions from Samantha. His decision to expand the storm shelter to include electricity, plumping, and gas masks are meant to protect his family. However, the process begins to affect his relationship with his wife, his employment, and friends. It becomes an enduring campaign backed by a cocksure intuition that something strange is coming. Meanwhile, Samantha exhibits the rational thinking that contrasts with Curtis’ gut instincts, and Hannah’s hearing is a metaphor for all the others who refused to listen to Curtis or even to hear him out. Then again, Curtis is not exactly crying out for help either, he continues to keep his physiological issues to himself. The most striking elements in Take Shelter are the visuals. Captured by glorious cinematography, the film has a visual and narrative composition that provides all the necessary elements to sympathize with both Curtis and Samantha. It is refreshing to see a film captured mostly on a tripod rather than the overused shaky-cam. The dreams begin just like any other scene in the reality, but through both cinematography and a well-composed score, the dreams are just as debilitating to the audience as it is to Curtis. Climate change has been cited as procuring some of the most drastic storms and natural disasters in recent memory. The film does not bring up scientific explanations for the natural occurrences in the film, but it does consider medical and psychological treatment for Curtis. Curtis’s premonitions fuel his sense of urgency in completing his shelter expansion, but his obsessiveness spurs questions from friends and family. His sentiment of faith of a unimaginable storm matches that of the expansive hold that conservative and evangelical have over America’s religion and political process today. 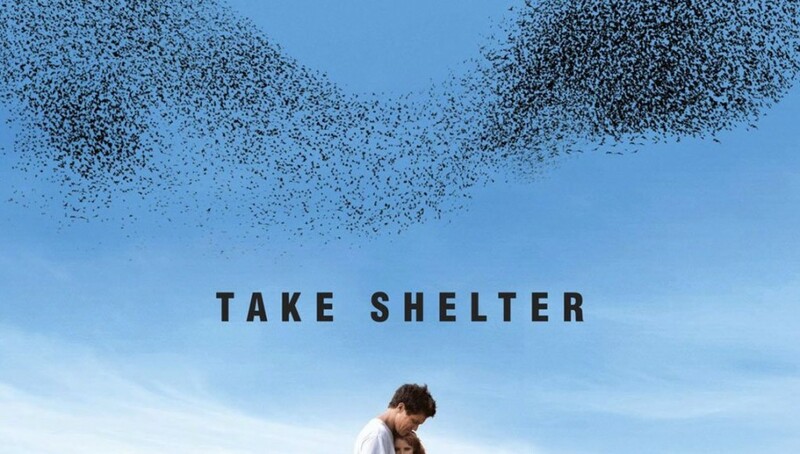 Take Shelter refuses to use gimmicks to keep the plot moving along. Instead, Director Jeff Nichols creates an effective narrative that is continuously suspenseful around each corner. Taking cues from The Birds and current anxieties of terror and destruction via natural disasters, the film conveys these themes in a highly accessible art film that has tremendous replay value.